The highlight of this Microgaming blackjack variant is the side bet on the value of the first two dealt cards being less than, equal to or greater than 13. It is essential to play the basic game in order to place the side bet. To start the game the player selects the chip of the desired denomination by clicking on it and then clicks the appropriate bet areas to place the wager. Chips can be removed one at a time by right clicking on the betting areas. At that point two buttons come into play. Clicking the Clear Bet button removes the wager. On clicking the Deal button cards are dealt from the shoe. Two cards are dealt to the player and one to the dealer. The side bet is immediately decided depending on the player’s hand value. The bet is settled and the chips removed from the table. 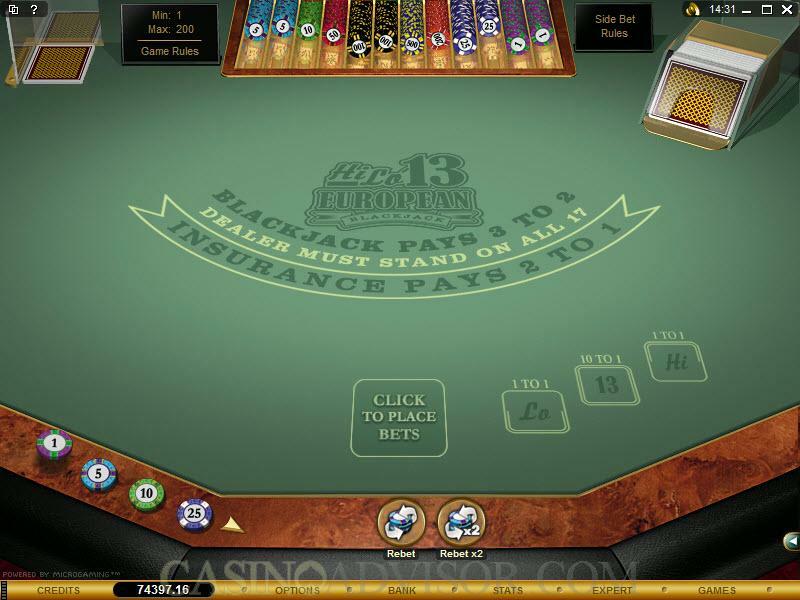 The options available to the player at that time, such as Hit, Stand, Insurance, Split and Double, are highlighted and the player makes the desired choice. Once the game is over the bet is settled and the cards removed from the table in the default mode. If the players want the cards to be on the table they have to click the appropriate check box in the Game Settings. The player has the option to the rebet the same amount or double of the last bet. The player can also place a completely different wager by following the method described earlier. The auto play can be enabled in the expert mode. It allows the player to set the number of deals and the time between deals. The player can stipulate a number of conditions under which the auto play automatically stops. These include stopping on any win, a specified win amount and if credits increase or decrease by a specified amount. Auto play in blackjack is played according to standard optimum strategy, which is fed into a strategy card. 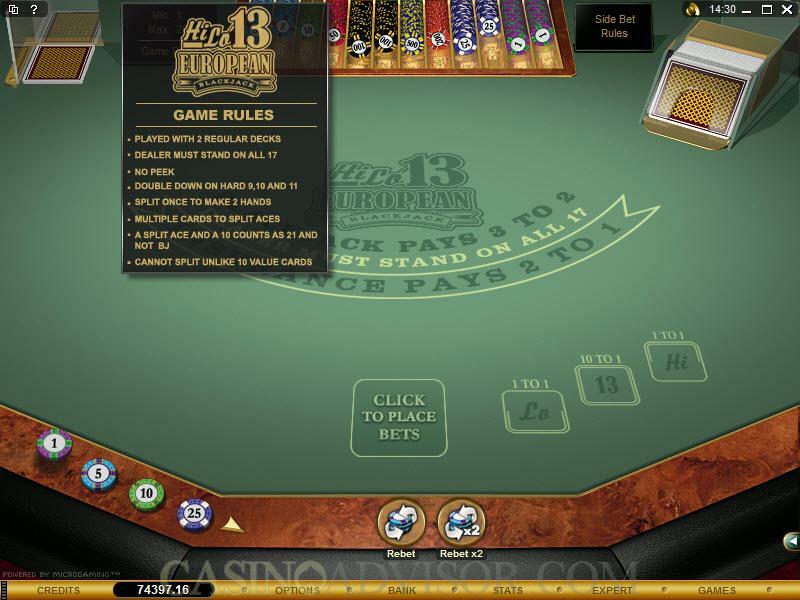 Hi Lo 13 allows players to make changes to the strategy card as they desire, save those changes and play the auto play games according to their own strategy. It is advisable that the default strategy is used. In the all sound options enabled mode there is a light background music played throughout. The dealer’s voice makes the announcements of the player’s total and the wins and requests players to place fresh bets after each deal. 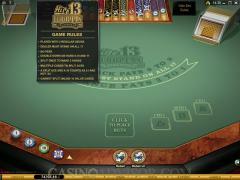 This simulates live casino conditions and makes the game more enjoyable. Interested in reading more detailed information about Gold Series Hi Low 13 Euro Blackjack? If so Click Here for more details.